So much of marketing is mental and a lot of people don’t realize that. They think, “Well if just do more, I’ll get more clients!” It doesn’t work that way, my friends. You have to get the internal stuff right before you can go out externally and get clients. This is why I work with so many women on getting all of their mind junk cleared so that they can show up and attract clients with confidence. 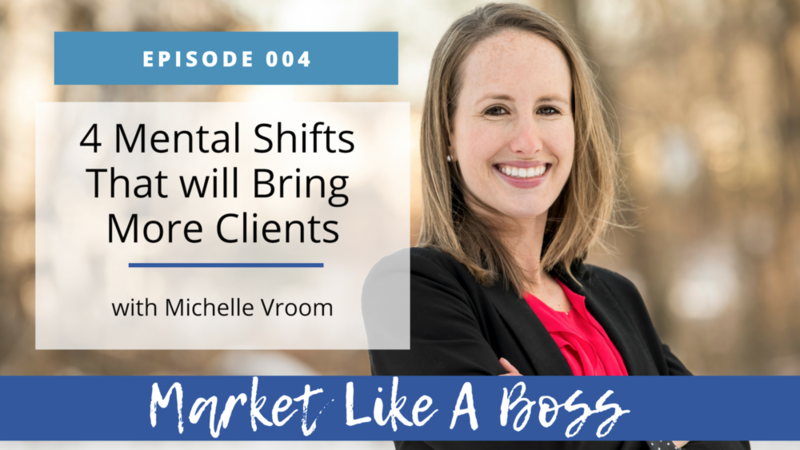 In my experience, I’ve found that there are 4 main mental shifts that need to happen in order for people to start bringing the right clients and consistently. The belief you don't have anything to offer ----> owning your expertise. Do you believe that you have something of value to offer? I see so many talented women who don’t believe that and it breaks my heart because they keep themselves hidden. This is such an important shift to make and if you don’t believe that you have anything to offer, your ideal clients aren’t going to either! One of the best ways to make this shift is to list out ALL of the achievements you made this year. If you find yourself drawing a blank, ask a friend or family member what achievements they’ve noticed in you. This list will remind you that you have something amazing to bring to the table! The belief that there are not enough clients ---> there are more clients than you could ever possibly serve! Do you believe that there are enough clients out there or do you find yourself feeling desperate? Here’s what happens when you feel that desperation: you undercharge, take on the wrong people, or you show up in a desperate way. You can’t form relationships when you are under that kind of pressure! The belief that you can’t serve your clients well ---> believing that you have the power to deliver incredible results. Do you believe that you can serve your clients and help them get incredible results? If not, then you are likely suffering from fear of success! This is something that I’ve struggled with. When I was working with my coach, we came to realize that I was sabotaging myself! I was keeping myself from getting clients because I didn’t believe that I could deliver on what I was promising. Have you ever felt that way? This is not an overnight fix, it’s a process and it’s something that you have to be able to move past if you have any hope in getting the right clients. I deliver incredible results because….. The belief that it’s not possible for you to get results ---> believing that you are ALL in on getting results! The only way that you don’t get results is if you decide to stop and quit altogether. If you are all in on your business, you WILL get results. Now, the timing of when you get results varies: I’ve had clients that got results within the first month, while others took longer. Marketing takes take time! Bottom line: if you go in expecting to fail, then you are not going to get results.